The 64-year-old Blumenthal, who worked as a senior White House adviser to President Bill Clinton, had his AOL e-mail account hacked last week by “Guccifer,” who has conducted similar illegal assaults against a growing list of public figures, including Colin Powell, relatives and friends of the Bush family, and a top United Nations official. The hacker’s e-mails went to hundreds of recipients, though the distribution lists were dotted with addresses for aides to Senate and House members who are no longer in office. But many of the addresses to which the Blumenthal memos were sent are good (though it is unclear whether [email protected] is a solid address for the Republican mastermind). Most of the e-mail recipients were sent four separate memos that were e-mailed to Clinton by Blumenthal during the past five months. Each memo dealt with assorted developments in Libya, including the September 11, 2012 attack on the U.S. mission in Benghazi. One memo marked “Confidential” was sent to Clinton on September 12. Blumenthal’s memos and e-mails to Clinton were sent to her at a non-governmental e-mail address through the web domain "clintonemail.com." As TSG reported last week, after Blumenthal’s e-mail account was compromised, the hacker searched it for e-mails sent to Clinton, and further sorted the mail to segregate any attachment--like Word files--that were included in Blumenthal’s correspondence to Clinton. Many of these pilfered documents were memos to Clinton on foreign policy and intelligence matters. While “Guccifer” appears to have downloaded many of these attachments, the hacker opted not to send the actual Word files to those on the e-mail blast list (likely as a security measure since the downloaded files could contain metadata that could lead to the hacker, who is the target of a mushrooming federal criminal investigation). Instead, “Guccifer” copied the text from the four Blumenthal memos and pasted them into separate new files. The hacker then made screen grabs of the new files and e-mailed those to the names on the weekend distribution list. 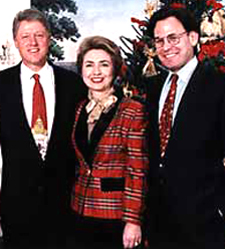 As seen above, “Guccifer” made sure, of course, to choose the despised Comic Sans font (and a pink background) when recreating the memos sent to Clinton by Blumenthal, who is pictured at left with the Clintons. The e-mails this weekend appear to have been sent from the hacked AOL account of the wife of a Hollywood actor. This tactic, which “Guccifer” has previously employed, seems to be another attempt to further shield the hacker’s identity. As for the location of “Guccifer,” that also remains a mystery. Though two IP addresses connected to the hacker’s recent online maneuvers have been traced to the Russian Federation, TSG has learned. However, this could be indicative of nothing since hackers go to great lengths to obscure their trail via proxies, IP spoofing, and powerful anonymizing software like Tor. “Guccifer,” though, did show some familiarity with the Russian media in Saturday’s e-mail blast. While the majority of the journalists to whom he sent the Blumenthal memos are based in the U.S., “Guccifer” also sent the documents (in a separate e-mail) to about two dozen reporters working for Russian outlets like Pravda, the Moscow Times, The St. Petersburg Times, and the RT news channel.